Corby Town’s miserable Vanarama National League North campaign ended with a emphatic 5-0 defeat at Harrogate Town. 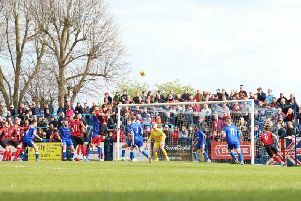 The victory secured the hosts’ place in the play-offs and it marked the end of terrible season for the Steelmen, who had already been relegated. The damage was done in the first 16 minutes as Harrogate raced into a 3-0 lead. They opened the scoring after just two minutes when Jordan Thewlis was brought down in the area and Brendan Daniels converted the penalty. Daniels scored his and his team’s second soon after when he volleyed in from a corner. And the game was all-but over when Daniels set up Lloyd Kerry to scored the third. Corby did have their chances with a couple of headers but Paul Clayton had an effort ruled out for offside at the other end. Ben Milnes had a shot well saved by Peter Crook before the break but two second-half goals wrapped things up for the hosts. Daniels struck the post with a free-kick but an unfortunate own-goal from Taylor McKenzie did make it 4-0. And the scoring was complete nine minutes from the end when Jack Emmett scored a fine individual goal.